Ryze Business Networking Group "Clusters"
Circa 1999 (registry year). Ryze was the very first social networking site on the web to really make it big. The owner was/is Adrian Scott who still owns and operates the Ryze network. His current blog boasts a wide variety of subjects - "testinggetsreal.com"
In 2003, the year I joined Ryze, this article came online at PCWorld "Consumer Watch: Can You Profit From Online Networking?" mentioning Ryze along side of Linkedin. Linkedin was a fledgling presence at that time. I met Eileen Brown (my web developer of late and long time online friend) on Ryze along with literally hundreds of other connections that I have to this day. Note that I was pushing 'clusters' as a viable networking system at that time too. It works and it still works quite well. Visit the current Clusters page to see how it might benefit you and your business. 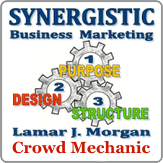 See also the Lamar J. Morgan profile at the Ryze Business Network. AND the group 'clusters' is still there too. Wow. Can you say "archives" really fast three times?